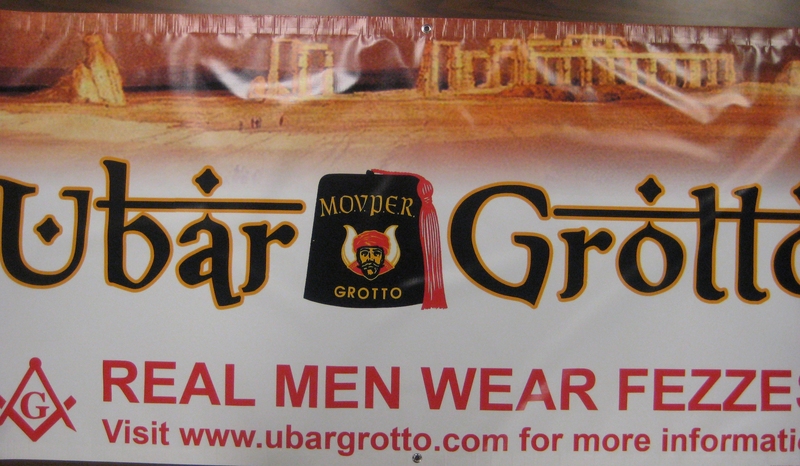 A banner day at Ubar Grotto! Click to see the full size photo. After some pricey quotes from fraternal supply houses, we decided to go back to the well and ask the folks over at Fez-o-rama to produce a banner for us. Being the great chaps that they are, they agreed and the design specifics were hashed out over several months. 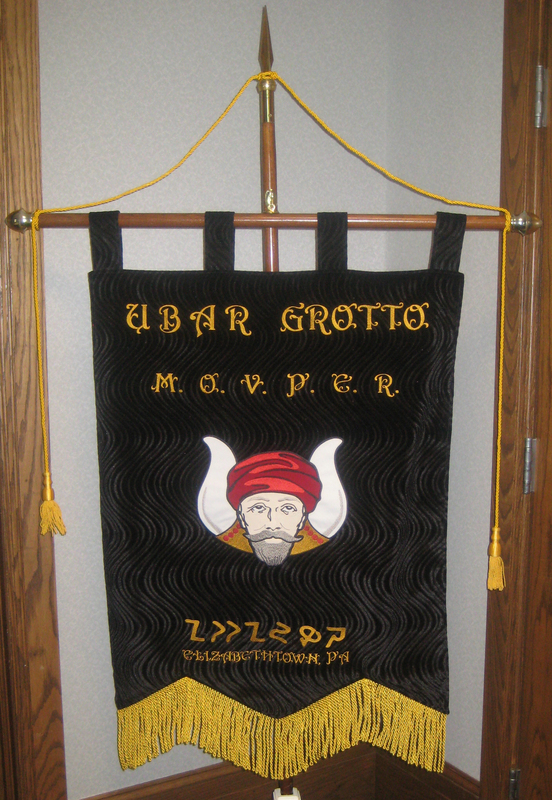 The trademark “wavy black velvet” of the Ubar fez would be the centerpiece of the design, making the banner fit the entire theme of Ubar Grotto’s regalia. It took several months of work, but today we finally have our official banner in hand! It will make its debut at our next stated session on May 6, 2012. This isn’t the only Ubar banner in existence though. The Prophets also recognized the need for a parade banner and a banner to be displayed at Harrisburg Area Roller Derby Bouts. Pro. David Labagh, Venerable Prophet, the creative genius at Ubar Grotto, was put to the task and started working on designs. After some tweeks and a few weeks at the printer, Ubar received two copies of the banner on heavy mylar. We look forward to using these banners at public functions and making sure everyone knows who the guys in the black fezzes are! A special note of thanks also goes out to Pro. Dave Blythe, of Ka-Jon Grotto, in Houma, LA, and Pro. Moe Evans, of Sem-I-No Grotto in West Palm Beach, FL, who donated the money to purchase this banner. Their names and Grotto affiliations have been embroidered on the back so that future generations know who made this trademark of Ubar possible!